Padre: This map is beautiful! Where did you get it? Timerider is the unusual product of writer/producer Michael Nesmith (yes, theMonkee) and director William Dear, who had previously worked together on ElephantParts. Nesmith, determined to work on getting non-mainstream movies made,actually made quite a good choice in funding this offbeat adventure. Though it's fadedinto relative obscurity, it makes a nice change of pace from similar Hollywood time travelfilms, remaining a favorite with many people. It also features an outstanding cast ofcharacter actors. Fred Ward stars as Lyle Swann, a championship motorcross racer who opens the movie racing in Baja, Mexico (though it was actually filmed in Northern New Mexico). His team sets themselves apart by using high technology to make their equipment as bold as possible, including a helmet Swann uses that features night-vision and zoom lenses. Unfortunately, at the same time the motorcross race is going on, a scientific project known as 'Timerider' is performing an experiment in the middle of the desert, hoping to teleport a small monkey 100 years into the past and then back again. Swann gets lost out in the wilderness, wanders into the project area and finds himself teleported to the year 1882. The only problem is, he doesn't know it. As Swann searches for help, he comes across three infamous outlaws who, after seeing his amazing motorbike machine, want to steal it and make use of it themselves. While fleeing, he comes across San Marcos, a small community where everyone thinks he's some kind of demon because of his clothes and technology. Though he's able to find a certain amount of help from a native woman, Claire (Belinda Bauer), he is still pursued by the vicious outlaws intent on stealing his cycle, led by Porter Reese (Peter Coyote). Low on complex sci-fi concepts, Timerider is more like a classic western with the twist that Swann is from the future, but doesn't quite realize he's been transported 100 years back. He figures he's simply wandered into some place where time just hasn't caught up yet, but he couldn't be more wrong. While very humorous, it is not silly, and does not use obvious jokes. The story works, thanks to the fact that it isn't very serious and is paced very quickly. Swann is thrown into the situation and never gets much of a chance to catch his breath, much less have time to do something that slows things down. While not an action extravaganza, Timerider is surprisingly taut for being relatively low-budget. William Dear and Mike Nesmith take some traditional clich&eacte;s of the western genre and make some fun of them just by virtue of the performances. On top of Peter Coyote, Richard Masur and Tracey Walter round out the central bad-guys, and a more perfect match would be hard to come up with. L.Q. Jones is his usual charismatic self as the local U.S. Marshall, and Belinda Bauer makes a great, non-traditional female co-star, retaining a great deal of mystery without just playing follow-the-hero. It's easy to see why this film has retained a loyal following since 1982. It's fun, extremely well written, and feels distinctly like a labor of love, rather than a commerically driven machine. While a time travel adventure at heart, it gleefully gives up any hope of appealing to sci-fi fans and instead becomes more of a satirical western. Also, the complete lack of that sci-fi element means that nothing really dates it, including special effects. Nesmith and Dear should be pretty proud to have made something that has withstood the test of time so well. Image Transfer Review: Timerider's 1:85:1 transfer is extremely pleasing, managing to look very solid and film-like without any obvious digital enhancements (sharpness and such). Both the light and dark details are very well rendered and given that most of the film takes place in the sharp daylight of the New Mexican desert, the retention of fine detail in the brighter areas is very impressive. The wonderful cinematography really comes across; I've never seen these areas of NM, where I live, look so natural on film without artificial lens coloring and such. However, one minor detail bringing the grade down just a notch is the presence of a small scratch on the source print that shows up for long periods of time, though mainly noticeable in dark scenes. Just a bit right of the center-top frame, there's a small vertical scratch that stays on the frame for almost some entire scenes. Audio Transfer Review: The new Dolby Digital 5.1 soundmix is very impressive, offering directional effects and surround ambience without sounding too powerful for the age of the movie. Most effects and dialogue remain in the center channel, but for many of the sequences, the left/right channels, as well as surrounds, are used to great effect for all sorts of things from the cavernous roar of Swann's motorbike to bullets flying about. Easily taking the best part of the soundtrack, though, is Mike Nesmith's effective country/rock musical score, which simply blasts out of the speakers with fantastic quality and balance. This is really a good home theater mix, offering some extra depth to a film that, most likely under another studio, would have been mono only. Extras Review: An excellent commentary from director William Dear is the central feature on the disc. Dear discusses his memories of making the movie, anecdotes about the production, and manages to be very enthused about it, which is nice considering it could have easily been a half-hearted track. He points out several facts about the staff and writing, and eventually settles into getting scene-specific about 20 minutes in. There are TV spots and the original trailer, along with the usual Anchor Bay approach to presentations (great menus, poster reproduction in the insert). Thankfully, no drastic alterations to the cover art have been made, meaning long-time, nostalgic fans of Timerider will simply see it on shelves easily. As great an edition as this DVD is, there is, sadly, one downside. It's either minor or really major depending on your point of view. Towards the end of the film, there is a bizarre and rather drastic cut made to the movie that changes the tone of the ending. Anchor Bay's response to the cut is that the DVD was mastered from the ONLY usable negative; a negative which contained this change. In retrospect, I think AB might have mentioned this somewhere, as long-time Timerider fans will be very upset and newcomers won't get the full ending. For me, personally, it's a minor issue, given the excellent quality of the transfer, but I'm sure not everyone will see it that way. As it stands, I can't say it effects my opinion of the DVD dramatically enough to give it a thumbs down of any kind. All that said, it does not effect the movie per se, merely the fate of one of its secondary characters. 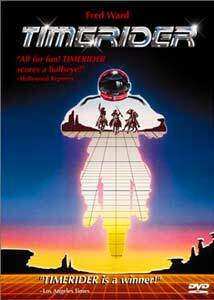 Timerider is a very entertaining, original experiment in time-travel stories thatnever takes itself too seriously. This DVD edition is a pleasing rendition of theunderground classic, but then I'm probably preaching to the choir as I'm sure a silent masshas waited for this one for some time.